Rick Wasmund went to Scotland two decades ago and realized he wants to make his own Whiskey. He managed to become an intern at Bowmore where he got his mad skills. Then, he returned to Sperryville, Virginia, and founded his own distillery. Now it's the only distiller in the US to do all of its own grain malting, using barley specifically bred for him. We'd let Christian fool us anytime he wants, because this unique-tasting Whiskey is sweet, smoky, buttery and delicious. Have a neat one for us, too! 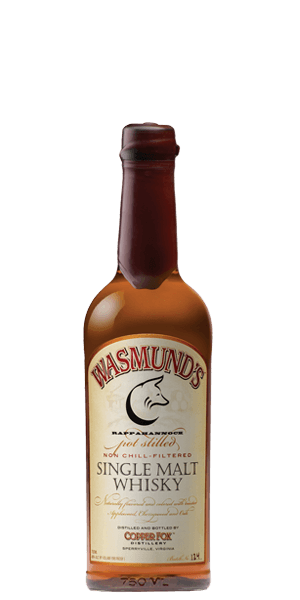 What does Wasmund's Single Malt Whisky taste like? The Flavor Spiral™ shows the most common flavors that you'll taste in Wasmund's Single Malt Whisky and gives you a chance to have a taste of it before actually tasting it. Herbaceous nose, earthy notes with a touch of linseed oil. The palate is earthy with strong hints of cherry and apple. The char note stays with you for a while. Open and lingering wood and cherry, almost like a cigar. It is a very good, intense, American Single Malt Whiskey with an intense birth; while a bold life leads to a long & fiery death. This is too high test, and sharp for me to drink neat. I make a killer cocktail with it though. Simple syrup, fresh lemon juice and blackberries wildly shaken. Flavor still cuts through. Also, i think it was much pricier at the distillery. This runs 48%. This was a bit too sharp for me. I used it for very swanky bourbon cocktails instead of straight and they were delicious. Strong flavor. This is really interesting. Wood smoke is definitely the dominant flavor. I disagree with all the reviews saying it’s awful - it’s definitely not bad. It’s a bit different though. If you like the flavor of wood smoke (not peat, which this definitely is not), you’ll probably like this. I really did not like this at all. At the risk of being crass... It had forward notes of kicked up dirt road gravel with after hints of what used to be caramel. The flavor...was like something salty and metallic was drug through that gravel road, followed by an aftertaste of more gravel and something I'm embarrassed to mention. In the immortal words of Mr. Horse, "No Sir, I don't like it." This is the first whiskey I can say that I would reject, if somebody purchased it for me. It offends just about every sense. The smell is overwhelming, not just of smoke, but of the dirt used to put out a campfire--coupled with nail polish remover. The taste is harsh, and closely resembles the smell--like licking the inside of an old man's mouth after 3 days of pipe smoking in front of a peat-fire. Hard pass. From the nose through the finish it is all smoke. This is the first non-Scotland single malts I tried. This Virginia distillery malts barley on a floor similar to a Scotch distillery but burns apple, cherry and oak to fire the still and those smoky, versus peaty flavors overpower this 96 proof whisky. Quite possibly the worst whiskey I have tasted. Pungent nose leads to a metallic taste, as if it were distilled in the barrel of a used rifle. The black liquorice aftertaste summed up this awful tasting experience. Too hot for the smokiness. very earthy, grassy. Spicy, smoky, Fresh cut grass meets forest fire. Well built whiskey but flavor profile is not for everyone. Loved the smoky smell and taste! This was my 3rd choice in the 3 samples. Was lacking a thing or two. Spicy sums it up. Not my favorite. Smelled of earth and soil and had a smoky twinge to it. Not for me. A disappointment, given how much I enjoy their rye. Unbalanced, and flavors of damp grass rather than dry smoke. Appreciate the spice, but not going to be adding this one to the bar. All I could taste was a chemically paint flavor. Did not enjoy. Disappointing drink. Maybe the combination of cherry and smoke turns to leather, but I tend to think cherry pipe tobacco. So here the flavor spiral doesn’t work for me. Leather up front and in the nose. Smoke and oak after stir up oil for the umami. Just not impressed. Smooth. A definite winner best or on the rocks. The smoke surprised me but finished well. Well-rounded, but a bit overly Smokey. As the first non-scotch single malt I’ve tasted I have to say it was quite good. I could clearly taste the flavors. I would recommend this to anyone looking to branch out. A whiskey with a unique flavor from the apple wood. Took me some getting used to, and worth doing, but not your every day drink. Great with a little water. There's a version sealed with blue wax that's even better, aged a bit longer in port casks. Amazing. Didn't think I'd like it, but they use floor-malting with apple and cherry wood smoking. Wasmund was trained at Bowmore on Islay. Apparently he learned his trade well. I love it. It's become a staple. Innovative and delicious, great new addition to the cabinet and for sipping around the fireplace. The spiciest, most unique Rye I've met. Smooth for its very young age, in a class of its own. Young. Funky smokey flavor. Almost mesquite. Interesting to try given the price, but also painless to miss. A good young whiskey. It has some nice subtleties to the flavor. It smells like it's going to be very hot, but turns out much smoother than expected. Good for mixing, but I could enjoy it straight in a pinch. This is a young whiskey with potential. The flavors are interesting and have a character all its own. I will follow them in the future and look towards their products as they mature as distillers!